Today we'll take another look at one of those programs you see in the Monday listings but probably don't pay much attention to: it's American Newsstand, ABC's afternoon effort to produce "news with an accent on youth." It was a ten-minute broadcast that ran five days a week, after the conclusion of American Bandstand (at 4:50 p.m., according to this week's listings) and attempted to capitalize on that show's audience to build a news market that the perennial third-place network felt was underdeveloped. The newscast began in 1961 and ran through the 1962-63 season; when Bandstand became a Saturday program, Newsstand went off the air. 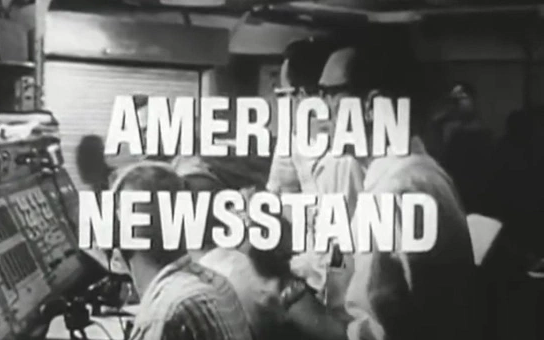 The primary anchors for American Newsstand were Roger Sharp, Bill Lord and Dave Jayne, and if you watch the broadcast below, you'll see that for a newscast tailored to a youth audience, it's surprisingly strong on hard news. In fact, there's probably more "news" content in this broadcast than you'd see on the evening news today. In the fall of '62, ABC launched Discovery, a daily series which could be said to be an early example of what came to be called 'infotainment'. At this point, American Newsstand was cut back to five minutes, and Bill Lord became the sole anchor. In the fall of '63, when Bandstand was cut back to Saturday, Discovery was cut back to Sunday mornings, and that's when Newsstand was dropped. Did you notice that promo that came up after the show, for the forthcoming episode of Bus Stop? You know, the episode that featured Fabian (who'd just been interviewed on Newsstand)? As for Discovery, who would you choose between Bill Lord and Virginia Gibson? Bill Lord was the News Guy. Virginia Gibson was a Singer. The reason ABC had only still photos of the launch of Enos (the chimp who orbited the Earth in a Mercury space capsule, paving the way for John Glenn's flight) was that in all likelihood, the network didn't carry Enos's launch live. I had heard that CBS and NBC did carry that launch live, and thus, were both able to use videotape of it on their evening newscasts.